File emails to multiple contacts (or several records of any kind) by clicking on the record on the ZynBit task pane. Use the appropriate green A (Actions) icon or the Quickfile (lightning bolt) icon to file the email for this person. To file an email to another record, simply navigate to that record on the contacts list and use the A menu or Quickfile icon to file the email again in the second location. The other method to refile an email is to use the Blue File Email icon from the top ZynBit navigation bar. 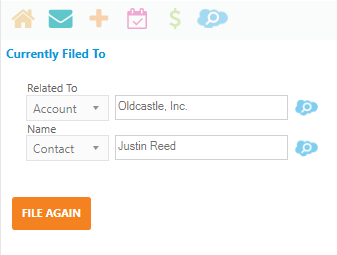 The File Email lets you file an email to any name and related object in Salesforce. If an email is already filed, the File Email button displays the current location where the item is saved, and provides a file again button at the bottom of the screen to file in an additional location.